SPL u-joints offer a number of features that help you get the most out of your vehicle—as well as benefits that the competition simply cannot match. 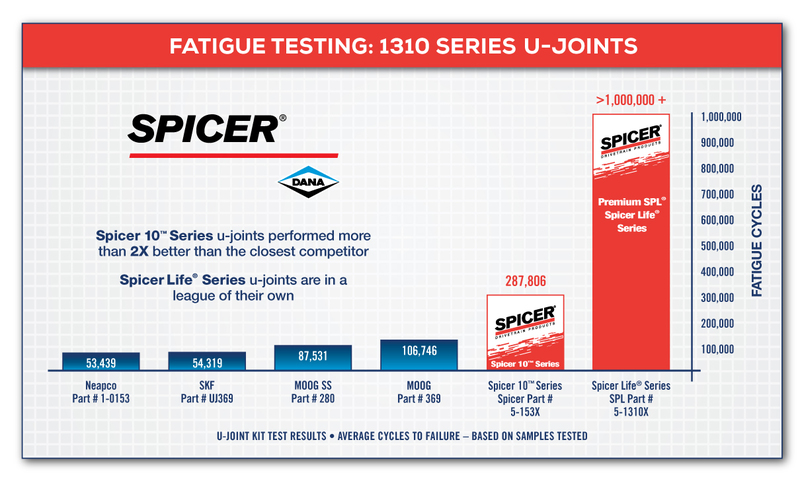 Spicer 10TM Series u-joints performed more than 2X better than the closest competitor. Spicer Life® Series u-joints are in a league of their own. No matter what conditions you throw at your 4WD vehicle, trust non-greaseable SPL u-joints with the triple-lip seal for premium performance. And when you need it, Spicer 4WD u-joint performance packs have everything for a complete u-joint change-out—with just one part number to order. Trust Spicer 10 Series™ u-joints to deliver the same balance capability and reduced driveline vibration that you expect from your original equipment parts. The patented manufacturing processes that go into the engineering Spicer parts help provide a tighter fit for increased durability in automotive applications. What about the competition? Well, Spicer 10 Series u-joints left them in the dust. In laboratory testing, these u-joints performed more than 2x better than their closest competitor! Plus, Spicer 10 Series u-joints are completely interchangeable, so you get total product compatibility with no change in part numbers. 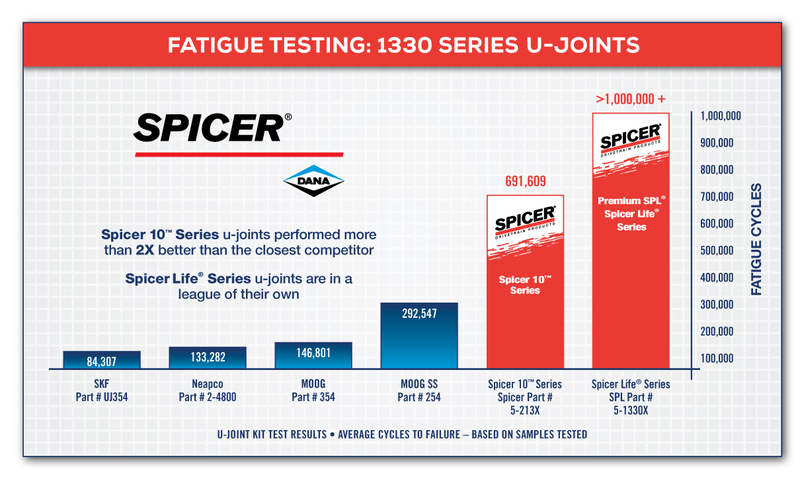 Spicer u-joints are part of a full line of Dana-backed parts designed to unleash the performance in your vehicle. Download our product literature, then contact your Spicer parts distributor and prepare yourself for unbeatable performance. You can trust Spicer Life® Series (SPL®) and Spicer 10 Series™ u-joints to deliver the same, or better, performance as your original equipment parts. That’s because they are original equipment parts! SPL® u-joints are available in both greasable and non-greasable options. Both offer unparalleled performance. Spicer® products consistently outperform the competition, offering the durability and dependability you demand. Need proof? Just look at the results of fatigue tests in the charts below! Plus, these parts are backed with a six-month, 50,000-mile warranty and an unbeatable level of service. Whichever Spicer u-joint you choose, rest assured you’ll get heavy-duty performance for your hard-working, light-duty vehicle.